Peillon is one of the nicest cliffs. Both the routes and the area are fantastic. One can climb all year around, except in July and August. 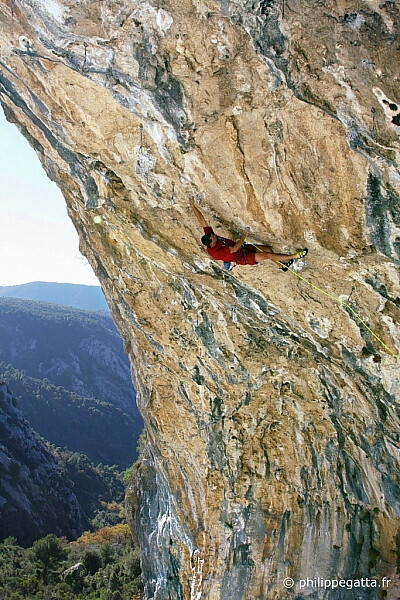 The routes located on the right of " La violence et le sacre " remain in the sun all day. The rest of the cave is in the shade in the afternoon. 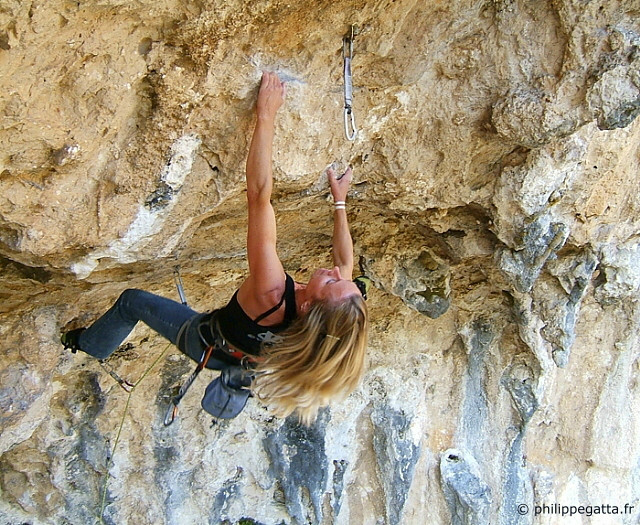 Most of routes are long, overhanging and with lots of tuffas. The routes are well bolted and most quickdraws are already in place. Just check out the slings. PDF version of Peillon's topo. Location 1.6 km before the village of Peille, around 30 minutes away from Nice, Alpes Maritimes, France. Road access Take the highway A8 and exit at La Turbie or take the roads D45 or D2564. From la Turbie, follow the road D53 toward Peille. Cross les Lacs, La Parran and 1.6 km before Peille, at the pass called Col de St-Pancrace, take left a dirt road for about 200m to a big parking. GPS: 7º 23' 56.2" E / 43º 37' 34.1" N.
Attention it's forbidden to access the cliff from the village of Peillon. Access to the cliff 35 minutes walk. From the parking, follow a trail heading South. The trail climbs toward the Cime de Rastel avoiding the summit by the left. 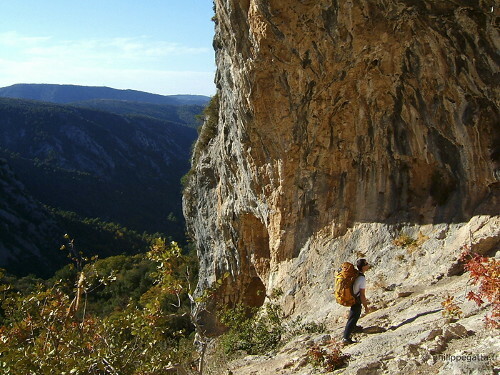 300m after the summit, take the trail going to left which descends to the Paul Arene sector and then the cave. Continue to the right for 300m. 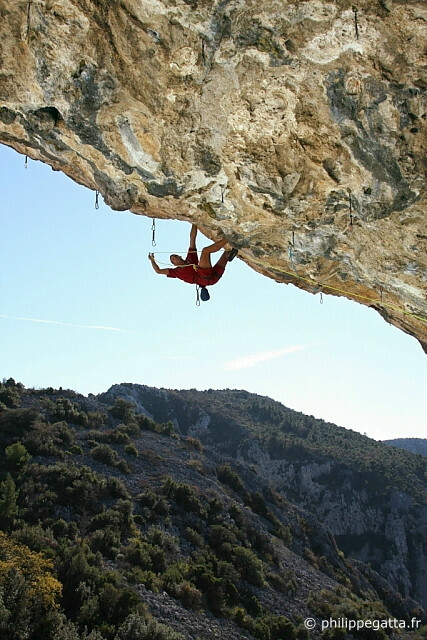 GPS: 7º 23' 27.0" E / 43º 47' 0.7" N.
Best climbing season All year round but spring and fall are better. The routes inside the cave are in shade in the afternoon, the ones on the right are always in the sun. Routes 38 routes from 6c to 8c. 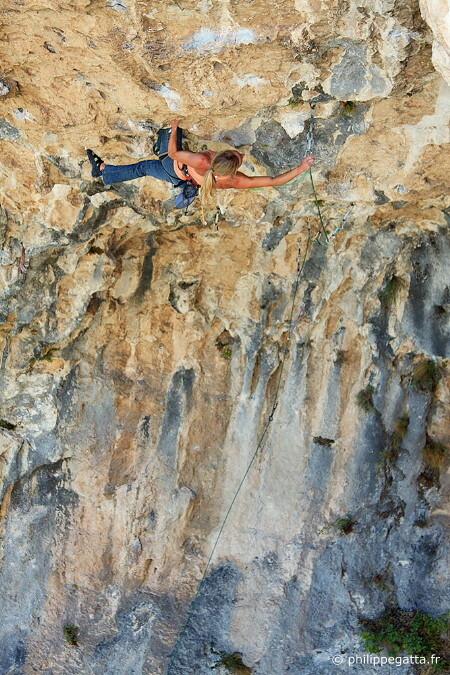 Require a 70m rope or even a 80m for some routes. Overall the routes are very overhanging with lots of tuffas. Bolts Most routes are bolted with 12mm bolts.